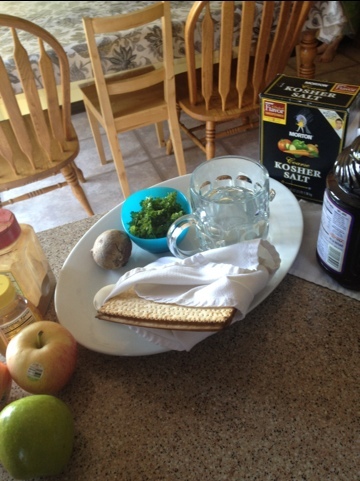 Flashback–A Little Flowers Seder Meal (and bonus meatless recipe–because I’m a giver). Azizen Pesach! Happy Passover to our Jewish friends & family! Today we celebrated this Good Friday with our Little Flowers Girls Club. Our virtue of the month is Wisdom, and our saint is St. Edith Stein, a convert from Judaism. What better way to get to know her (and how she felt led into the Catholic faith) than to take a look at the types of foods her family would have had on their seder plate when they celebrated the Passover? First we had a quick refresher of what Passover means and why our big brothers & sisters in the faith celebrate it. We also reviewed that this was the meal Jesus shared with His disciples when He gave us the Eucharist. As I explained each symbolic food to the girls, I asked them to “find” how that same symbol shows up in our faith life as Catholics.